My mom thought I was crazy when I called her on my way home with an ice pack on my burning chest wedged between my bra and sweater to cool off what felt like the worst sunburn ever. What I thought would be a burning sensation for days, only lasted an hour or so. If you haven’t heard of IPL, it stands for intense pulse light and is sometimes called IPL Photofacial Rejuvenation. It is a cosmetic procedure that was introduced in the 1990’s. IPL is used to produce younger and healthier looking skin. 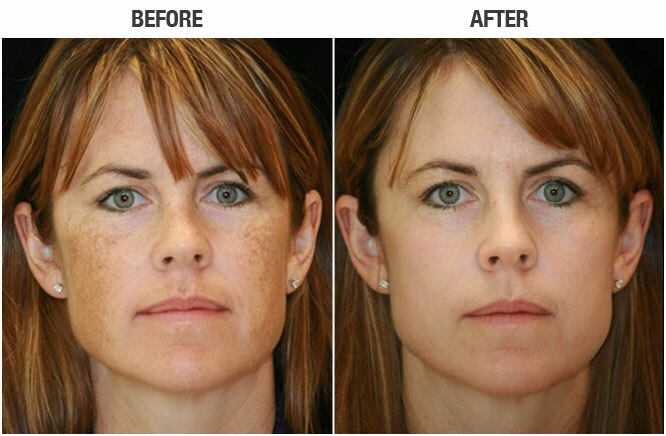 Due to the short down time and what some think as little discomfort, IPL is used to get rid of red blemishes that originate from blood vessels and brown pigment blemishes in the form of freckles, age spots, and other sun damage. Other major benefits include the increase of collagen production, smooth and evenly pigmented skin, and smaller pores. I have even heard that this procedure is used to get rid of unwanted hair. A machine is used with a device attached that almost looks like a long rectangular pen that is used against your skin while it is zapped with the intense pulsed light. The technician methodically moves the ‘pen’ against your skin in vertical lines. This procedure lasted less than thirty minutes. Certain wavelengths of this light spectrum are used to treat specific “target” conditions of the skin while light energy is turned into heat energy. The chromophore in the target tissue is fragmented and absorbed without damage to the surrounding tissue. Likewise, new collagen deposition is stimulated, leaving the skin with smoother texture, while brown and red spots disappear and broken veins close. The trained technician made it seem like the procedure was not a big deal and I should do my face. I am so happy I didn’t. Is this procedure a one shot deal? It generally takes a series of treatments I was told to see the best results, such as three to six treatments, usually a month apart. It felt like burning stings as the small machine pointer shooted infrared light through my skin. It was not pleasant, but bearable. Why did I choose IPL for my chest? It has been all the rage in LA for quite some time now. I have had friends who have had it done on their face to fade brown spots and sun damage. I am very glad I didn’t get IPL on my face because my chest looked horrible for at least two weeks. I figured my chest would be a good way to test the procedure. I have spent too much time in the sun, and I thought I would try IPL in that area to see the results, although I was told I’d be hooked and the procedure shows the best results after coming in at least three or four times. Not a cheap procedure, my skin showed now every past dark sun spot from the sun that had faded away. My whole chest area to my collar bone was reddish brown and freckled. I even had a couple areas on my collar bone that burned right through my skin. Thank goodness I heal well because that too was part of my recovery. What results did I experience? I was told to not pick or touch the area and let it come off naturally. After about a week and a half, my reddish brown blotches started to fade away. I was worried they may not. After two weeks, my skin felt more like a baby’s bottom and looked tremendously better – more even toned. Almost every single brown spot was gone. Would I try this procedure again? Why Kalologie? What other services does Kalologie 360 Spa offer? I think I would definitely stick to the wonderful skin-refining facial I received beforehand from Christine which included a massage and a delicious smelling enzyme mask. She included numerous delicious smelling treatments on my face, which almost put me to sleep and took my stress away. Kalologie 360 Spas combine the latest in rejuvenating skin care, restorative massage, expert waxing and glowing tanning services. Some of their most popular procedures include lasers for stretch marks and acne scars. The new Vampire lift and the 1440 Fractional Laser are coming soon. The Vampire Facelift or PRP (Platelet Rich Plasma) therapy involves taking a vial of the patient’s blood, isolating the platelet-rich plasma and injecting it back into the face or other areas of the body. In theory, the platelets, which contain important growth factors, should ignite tissue regeneration and stimulate collagen production. The result: smoother, younger-looking skin. They also offer extended hours, so you can enjoy the benefit of spa services any day of the week. 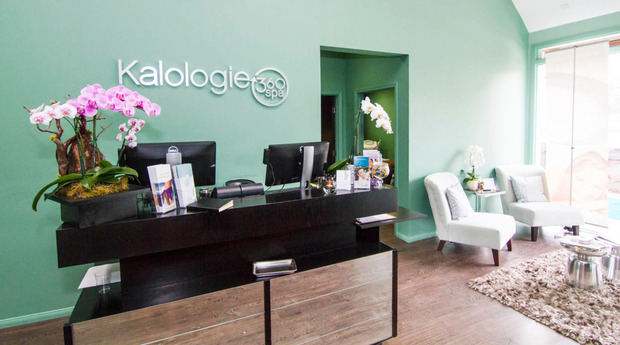 The Kalologie Spa Pass offers members special member-only pricing to help add to the satisfaction of visiting a Kalologie location each and every month! The customized plans allows your personalize a combination of massages, facials, peels, waxing, and tanning each month. Spa Pass Memberships include one customized one-hour massage or classic facial every month, and special membership pricing on spa services and Kalologie Labs retail products. What makes Kalologie so convenient? The Kalologie 360 Spa believes that spa services should be accessible and convenient! The ability to schedule back-to-back spa services at convenient times, or with flexible treatment options, is no longer a luxury, it is a necessity. Customers in a hurry can book an express facial, waxing, tanning, or massage and be back to work before the end of a lunch break, while those looking to maximize their spa time can schedule multiple appointments, one right after the other. And sometimes, it’s time to just simply decompress, with a relaxing yet rejuvenating deep-tissue massage.